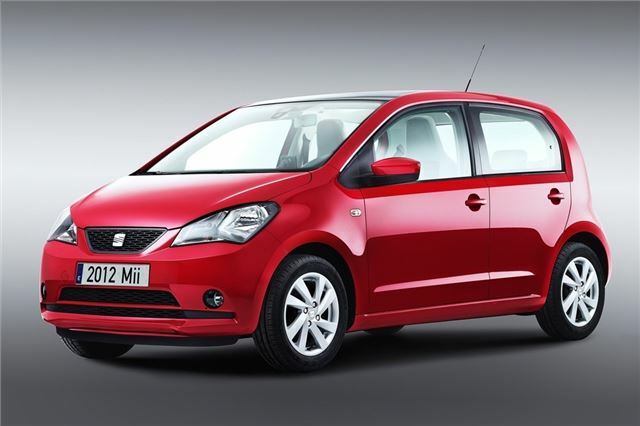 SEAT has unveiled details of the five-door version of the new Mii. Identical in size to the three-door model, the more practical five-door features wide opening rear doors to make getting in and out easy, even in tight parking spaces. Prices will be announced nearer the Mii's launch in June, but it's expected to cost from £7,500. It's the same 3.56 metres in length as the three-door Mii, so is just as easy to park and manouevre in small spaces while SEAT says that the large rear side windows mean good all-round visibility. The rear windows don't wind down but they do at least pop-out for extra ventilation. Boot space is 251 litres - impressive for a car this small - plus the back seats can be folded down to increase the carrying capacity further. The Mii is also available with an optional panoramic sunroof which extends most of the length of the Mii's roof. It can be opened via a tilt and slide function plus it includes a sliding roof blind. The five-door Mii is powered by the same engine as the three-door - a 1.0-litre three-cylinder petrol that comes in two versions, one with 60PS and one with 75PS. As you'd expect, economy is a strong point with the Ecomotive version of the 60PS model emitting just 96g/km of CO2 with a claimed average of 68.9mpg. The Mii is also available with City Safety Assist which uses a laser to identify vehicles or obstacles in the direction of travel, regardless of whether they are stationary or moving. If the system detects the risk of an impact and the driver doesn’t apply the brakes, the system applies the brakes fully or helps the driver to apply maximum braking force. In many cases City Safety Assist can help to avoid an accident altogether or reduce the severity. In terms of on-board occupant safety there are head restraints for rear seat passengers and child locks on the rear doors as standard.